A Christian street preacher targeted Muslims and gay people in "religiously aggravated" sermons, a court has heard. 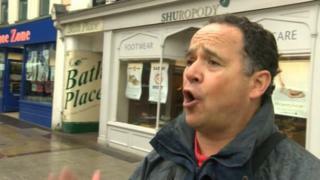 Michael Overd is alleged to have made "belligerent and angry" remarks over a loudspeaker system set up in the High Street of Taunton, Somerset, last year. One witness told the town's magistrates' court Mr Overd also disparaged the Prophet Muhammad during one outburst. He denies using threatening or abusive words. Prosecutors said Mr Overd gave sermons in June and July last year. The first witness, Darren Chalmers, who described himself as an "openly gay Christian", told the court he felt "belittled and ashamed" by Mr Overd's sermons. "I felt so ashamed by the comments, that I was a sinner, that God made Adam and Eve, not Adam and Steve," he said. Michael Phillips, defending, asked Mr Chalmers if he thought Mr Overd was entitled to freedom of speech. Mr Chalmers agreed the preacher had a right to hold particular views but it was "not fair" for them to be "shoved down people's throats". A second witness, Nigel Marley, described Mr Overd's tone during his speech as "belligerent and angry". The third witness, Shelley Cunningham, described Mr Overd's style as "ranting" and said she heard him make defamatory comments about the Prophet Muhammad. She said: "There was no mention of good of the faith [Islam], no mention of repenting, they were all going to hell. "I could see quite a crowd gathering, people were getting really het up, frustrated." Mrs Cunningham also said his comments caused offence, partly because he was talking to people through a microphone connected to loudspeakers. Under cross-examination, she agreed people had a right to discuss controversial aspects of history. Mr Overd faces two charges of using threatening and abusive words, and a third of causing racially or religiously aggravated harassment, alarm or distress.